Studio pottery is, perhaps, something that cannot be precisely defined - it doesn't have a clearly defined time frame and neither was it an all encompassing movement like Art Deco or Art Nouveau. 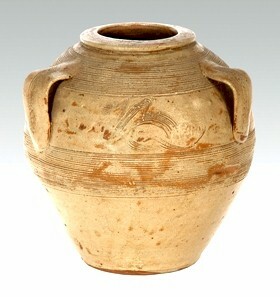 A Bernard Leach stoneware vase, circa 1947. If there was a founding father then it was Bernard Leach and if there was a gestation period then it occurred during the Art Pottery movement of the later 19th century. From its earliest point the two greatest influences seemed to be the Orient and the high esteem that Chinese and Japanese art potters were held in and on the opposite side of the world in England the rustic hands on practicality of artisan potters. Bernard Leach was born in Hong Kong eventually settling in Tokyo where he was, by chance, in 1911 invited to a raku tea party attended by Ogata Kenzan 6th and was so smitten by pottery he left his job at the bank. By 1919, Leach had already had two exhibitions in Peking and Tokyo where he met Shoji Hamada, the following year they had established their first kiln and pottery in St Ives. The rest, as they say, is history as, with the exception of Reginald Wells (who arguably was the first studio potter) and Charles Vyse, most of the earlier studio potters were students of Bernard Leach or worked at his St Ives pottery. The list is endless and includes Michael Cardew who initially studied with William Fishley Holland before being apprenticed to Leach in 1923, Katherine Pleydell-Bouverie in 1924, Norah Braden in 1925, Sylvia Fox-Strangways in 1926, William Marshall in 1938 and obviously his own son David Leach in 1930 and, thereafter, a dynasty of Leach potters. 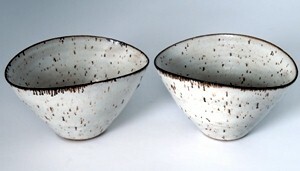 A pair of thinly potted stoneware 'squeezed' bowls by studio potter Lucie Rie. However, not all studio pottery emanates from that auspicious family tree. There are some striking exceptions, especially Hans Coper most notable for sculptural and cycladic forms and Lucie Rie whose finely potted domestic forms often had striking glaze finishes and the architecturally proportioned jugs and plates of Michael Casson. 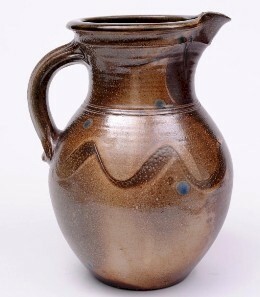 A Michael Casson large stoneware jug, circa 1975. The West Country has the breeding ground for studio pottery with both St Ives and Dartington Hall being supremely influential at times, the latter with the help of Bernard Leach (who was teaching there) hosting the only International Conference of Potters and Weavers in 1952. The West Country still continues to foster good contemporary studio potters such as the evergreen Marianne de Trey who is still at Dartington, Svend Bayer, Clive Bowen and John Maltby, oh and of course Jeremy Leach and John Leach, the great man's grandsons! 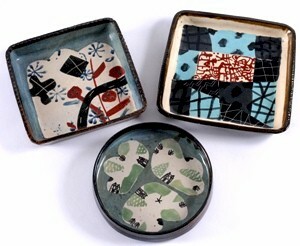 Three stoneware dishes from the John Maltby Stoneshill Pottery.